Emerson Climate Technologies Awards Annual Thomas E.Bettcher Community Service Award. Emerson Climate Technologies Awards Annual Thomas E. Bettcher Community Service Award. 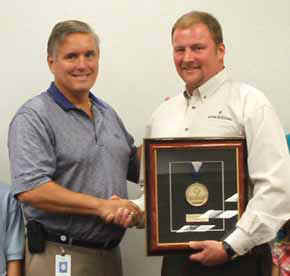 Local Non-Profits Benefit Emerson Climate Technologies has awarded the annual Thomas E. Bettcher Community Service Award to Nate Stephenson, a senior project engineer in the Semi-Hermetic Refrigeration group and an Army Reserve Veteran. The award, named for the former Emerson Climate Technologies President and CEO, recognizes an employee whose excellence in community service reflects the legacy of leadership and sustained community involvement demonstrated by Tom Bettcher. "I am honored to be awarded the second annual Thomas E. Bettcher Community Service Award. My father always said, 'treat others the way you want to be treated,'" Stephenson said. "I'm happy that by winning this award, others have become inspired and active in the many opportunities available to help those in need." The award includes a grant that Stephenson directed to Houston Athletic Complex , Houston Ball Association, Hardin- Houston Youth Football and Wheels of Truth - Motorcycle Ministry. With the support of his wife and family, Stephenson's selfless passion for helping others in need extends from community and church involvement to Emerson's own events and volunteer opportunities. Stephenson played a major part in constructing a new orphanage in Rosarito, Mexico while on a mission trip to Tijuana, Mexico. "Working with the kids to instill Christian values is dear to my heart, Stephenson said. "They are the leaders of tomorrow." Stephenson is also a team member in Emerson's Engineering Career Seminar for high school students, which helps guide students that have an interest in engineering. "Emerson employees like Nate give a tremendous amount of time and talent to supporting our community. This award celebrates the many individuals within Emerson who collectively represent our organization's commitment to service and community involvement," said Ed Purvis, business leader of Emerson Climate Technologies. For more information about Emerson, visit www.Emerson. com. For more information about Emerson Climate Technologies, visit EmersonClimate. com.